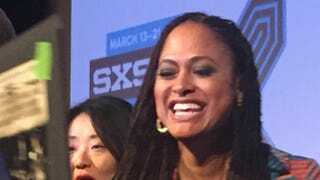 From Selma, Ala., to South by Southwest, filmmaker Ava DuVernay took her message of living in the moment and being grateful for what she has to the masses in her keynote address Saturday at the annual festival in Austin, Texas. The director, whose film Selma was nominated for a best picture Oscar, broke away from a busy schedule to speak at SXSW. She’s working on two TV shows, one of them a series for Oprah Winfrey’s network, OWN. The other is a network series called For Justice. DuVernay described the show as a procedural featuring a Justice Department civil rights investigator played by Anika Noni Rose. DuVernay started her talk by sharing how bad her week had been and how she turned that around and made something positive out of it. DuVernay said she has picked up a habit of writing down five things she is grateful for each week. “A certain woman whose initials are ‘O.W.’ got me into the habit of doing that,” she told the audience. DuVernay talked about what she called “the intention of our attention” and the importance of leaving yourself open to larger possibilities that you may miss if you’re focused only on small things. It is clear that DuVernay is a true believer in being grateful in the moment. She said it was not until she made Selma that she truly awoke to that awareness of the importance of gratitude. Unlike with her first two films, I Will Follow and Middle of Nowhere, DuVernay said that when she started Selma, she was not consumed with filmmaker concerns. “Serve this story” was the only thought in her mind and the one goal in her heart when working on Selma, she said. Serving the story is what allowed her to put ego aside and give up her writing credit for Selma to get the movie made, she said. She was particularly moved when talking about how fulfilling it is when people tell her how Selma has touched their lives.